A solid financial plan begins with the financial advisor client’s input. As a successful financial advisor or financial consultant, you must have a clear picture of his current finances, goals, concerns, and any potential threats or issues that could impact his finances. Start by gathering copies of your client’s household budget, bank statements, loan statements, credit card balances, investment statements, insurance policies, and family governing documents (such as a will or estate plan). What keeps you up at night? What concerns do you have about money? What experience do you have working with a financial advisor, if any? How would you describe what your life looks like in five years, ten years, and twenty years from now? What concerns do you have that are unrelated to money? How would you describe a successful financial advisory relationship? These questions loosen up clients to provide you with much more relevant input than merely what appears in their financial documentation. Even better, the answers to these questions and the resulting discussion provide a context for understanding the details in the financial documents. Only by talking with your clients do you begin to understand any frustrations they face with their current financial situation and any encounters they’ve had in the past with other financial advisors. You may also gain insight into the client’s mindset and behaviors that have contributed to these frustrations. Listen not only to what your clients say, but also be aware of what they’re not telling you. Often, I’ve found that clients reveal more in what they omit from the narrative of their financial life than what they disclose. Sharing past financial decisions and mistakes is much more personal for clients than sharing intimate details about their health with a doctor. Even though most health issues arise due to poor diet and lifestyle decisions, patients often withhold that information, either because they’re embarrassed about it or because they don’t want to be told to make difficult changes. Invite clients to share with you all their financial experiences — the good, the bad, and the ugly. Full disclosure provides the most valuable input when developing a client’s financial plan. Getting input from a financial advisor’s clients is important to your success as a financial advisor. Because each client’s financial life has so many different facets, even when the individual isn’t a high-net-worth client, I developed a useful guide to organize a financial advisor’s thinking. I call it The Three Cs of a Holistic Financial Plan. The Three Cs of a holistic financial plan. 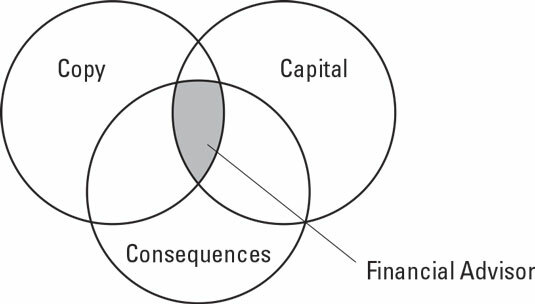 The area of overlap is where you, the financial advisor, operate when you’re developing a holistic financial plan. Each area requires specific care and attention, not only in terms of making client assessments, but also with regard to uncovering the levels of uncertainty that a client may be comfortable living with. Copy (words on a page) refers to all the written documentation or family governance paperwork that’s been drawn up (usually by an attorney) to spell out what the family’s intentions are for their assets. In most cases, these documents are family trusts or wills, medical directives, powers of attorney, and other related documentation that dictate how the family is to act and who in the family will be in control when a patriarch or matriarch is no longer able to make decisions regarding their household matters. Triggering events could be as varied as early onset dementia, Alzheimer’s disease, or any other mentally or physically debilitating disease. More often than not, families must handle some level of deterioration in health of a parent or other loved one before death occurs. Making sure that all matters have someone who can step in, and be in charge, is extremely important. Your role in respect to the copy aspect of a financial plan is to be sure that your client has received legal counsel in these areas and has the documentation to ensure that the directives are carried out. You may want to include this package as part of your service or charge a separate fee for preparing it. Having all of this information in one place makes it easy for authorized relatives or friends to take over when necessary. In the event that it’s needed and used, the relatives or friends in charge will greatly appreciate it and likely sing your praises to everyone they know. Capital (any asset or investment holding) refers to all allocations of household money, including all claims (or demands) on those assets. For example, in most U.S. households, the largest family asset is the primary home/residence. In other families, the most valuable asset is the family-owned business. These assets typically have some kind of debt associated with them, such as a mortgage for a home or a line of credit for a business. All the various components of capital are constantly changing. Fluctuating stock and bond markets, real estate markets, the business environment, economic expansion or recessions, and so on all dictate the market value of these myriad holdings on any given day. Market valuations plus the liabilities associated with these assets affect the household’s net worth. Unknown liabilities (such as those that blindside a family — disabilities, death, job loss, and so forth) can wreak even greater havoc on a household’s net worth. As you develop your client’s financial plan, you must account for all the capital assets and liabilities and review the plan regularly to ensure that the household’s net worth is on track and address any and all potential threats to that net worth. A difficult family dynamic or dysfunction that persists for decades and becomes a major threat to the family’s capital at a point in time when most families achieve a heightened awareness of the desire to maintain their lifestyle. The panic that often ensues after the stock market plummets, which can drive clients to liquidate their holdings at the worst possible moment. Doing so creates a long-lasting consequence, which isn’t easily rectified. Naming a trustee or executor within the family documents who has a contentious relationship with family members or siblings, which can create terrible long-term financial and emotional consequences. All of these situations (and others) are avoidable with the proper planning and proactive approach, and all of them are part of your responsibility as your client’s financial advisor. By addressing any and all scenarios that could place your client’s capital at risk, you give your client the best opportunity for success. One of my clients, a business owner in his 60s with a net worth of $20 million, was on his third marriage and had six children. As with any blended family, getting the family governing documents (copy) up-to-date was essential for the family to avoid any ugly surprises down the road. In this client’s case, I made introductions to a couple local estate planning attorneys and let the client meet with both and make the choice. Getting the copy part completed took nearly a year due to various circumstances, including vacations, family events, and good old-fashioned need-to-think-about-it time delays. As a financial advisor, your job is to steward this process, which means gentle and timely prodding to move the process along. You never know what may lurk around the corner in terms of life events, so you want to wrap up the estate planning as quickly as possible. At the same time, I worked with the client to align his capital with his copy to proactively address any unforeseen consequences. The capital part of his financial plan included one-time gifts, liquidity from life insurance policies, and market liquidity from his investment portfolio. I structured capital in a way to avoid any illiquid investments that could have caused extra stress or concern to the family in the event of any major family crisis, especially one that would impact my client’s ability to shepherd his family through the crisis. Within two years, my client was diagnosed with a serious illness and started treatment. Knowing that the copy was in place and that it aligned with the capital was a great personal relief to me and provided the family with the assurance and financial support they needed to make it through this challenging period in their lives. It allowed the family to focus on getting their primary breadwinner back to health instead of having to worry about unintended (but well-planned-for) consequences. Having the client’s wishes clearly documented also assuaged the fears of family members, which often leads family members into contentious power struggles when they fear that their needs won’t be met. Everyone understood that the planning had been done. The key to this client’s success was having a detailed financial plan in place that covered the three Cs of financial planning well in advance of any subsequent life event.